While introducing iOS 8 at its Worldwide Developers Conference today, Apple announced a host of improvements for its popular iMessage messaging platform, including in-line audio and video messages and new group features like Do Not Disturb and more. The in-line video and audio messages are accessed from a small radial menu on the right of the text-entry field, allowing users to quickly choose whether they want to send a video or audio message. Like Snapchat, the audio and video messages "self-destruct" after a certain amount of time to save space. However, users can also choose to keep them if they really want to. Users can play the media from within the message thread by pressing the "play" button or simply raising the phone to their ear, which also works straight from the lock screen. In addition, group messages have received numerous improvements, including Do Not Disturb, the ability to name conversations and add or remove people from the group chat. Locations can also be shared, and can be chosen to be shared for a certain amount of time a day. I'm glad you can finally silence and withdraw from those annoying group iMessages. very cool to listen to an audio message while in lock screen with only putting phone up to your ear. 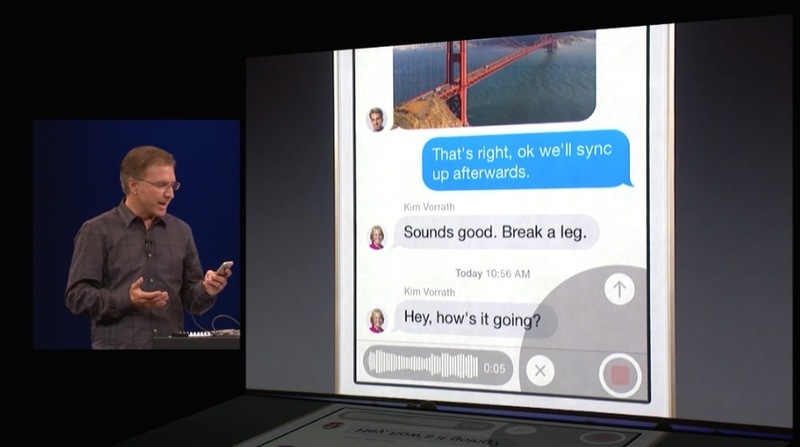 They didn't mention if iMessages will show up in iCloud web service. That is where I REALLY want it; it will offer communication when on a PC. Hope it will still come, I could really use it. Amazed there is no mention in the article about being able to LEAVE a group message now. I absolutely hate those things! You can turn them off on your end, which disables you from being able to send them, but that does nothing to prevent people from adding you to one. This was probably one of my biggest peeves with messaging in iOS.